Getting started with the Tinkercademy Micro:bit Breakout Board. Connect stuff! Make stuff! Stuff! We made the Tinkercademy Micro:bit Breakout Board, in collaboration with ScienceScope UK (an original partner for the Micro:bit launch) to make connecting external components simple and fuss-free. Instead of using crocodile clips, many jumper cables, or breadboards, just plug in the coloured Octopus parts onto the board, and you’re good to go! In general, we recommend using Pins 0, 1, or 2, moving on to 8, then 12 to 16 if necessary. These are “free” pins that aren’t tied to micro:bit functionality. Read more about pin details below. If you do need the intermediate pins, they should work fine for digital or analog output, as long as you don’t need the corresponding functions on the microbit as documented in the link above. Pins marked for analog output (analog read) are Pins 0, 1, 2, 3, 4, and 10. These pins have a ~ symbol on top. For the ADKeypad, we recommend using Pins 0, 1, or 2. This is because higher pins have higher impedance that may prevent the signals from going through. Some components may be easier to use with additional libraries, e.g. the ADKeypad, OLED, and Crash Sensor. On MakeCode, please add a package (Advanced > Add Package), search for Tinker Kit, and add the tinkercademy-tinker-kit package that comes up. If you’re using components other than those in our kit, and you find that digital reads only give you false readings, you can try setting a pull-up on that pin (see figure). If you have any questions about using the Breakout Board, please feel free to get in touch! This will open up a dialog box. Search for Tinker Kit. Click on the search icon or press enter, then select tinkercademy-tinker-kit. This will add two libraries: Tinkercademy, for general-purpose sensors found in our kit, and OLED, for the OLED module (ours has a height of 64 and width of 128). We're not using the OLED module in this tutorial, but you can! The Breakout Board is pictured here connected to the micro:bit and several components. This enables the micro:bit to fully utilise all the components found in the micro:bit Tinker Kit. Pictured: Close-up of OLED (top), LED (bottom left) and motion (PIR) sensor (bottom right). Also, the code that powers the demo. Click to zoom! We’ve labelled the names of the components in the figure shown, and a way to store them back in your kit when you’re done. * Some components may be easier to use with additional libraries, e.g. the ADKeypad, OLED, and Crash Sensor. On MakeCode, please add a package (Advanced > Add Package), search for Tinker Kit, and add the tinkercademy-tinker-kit package that comes up. The Tinkercademy Breakout Board has rows of Ground, Voltage and Signal pins (“GVS”). Each Signal pin is paired with a Voltage and Ground pin, so that modules can be plugged in directly without the need for a breadboard. The board also exposes I2C in a pinout that allows one to directly plug in the most common OLED displays, for when the micro:bit’s 5x5 LED matrix doesn’t quite cut it. SPI and UART Serial pins are also exposed for connection to devices like SD card readers and GPS modules. Unlike the three large pins that are dedicated to being used for external connections, some of the small pins are shared with other components on the BBC micro:bit board. For example, pin 3 is shared with some of the LEDs on the screen of the BBC micro:bit, so if you are using the screen to scroll messages, you can’t use this pin as well. 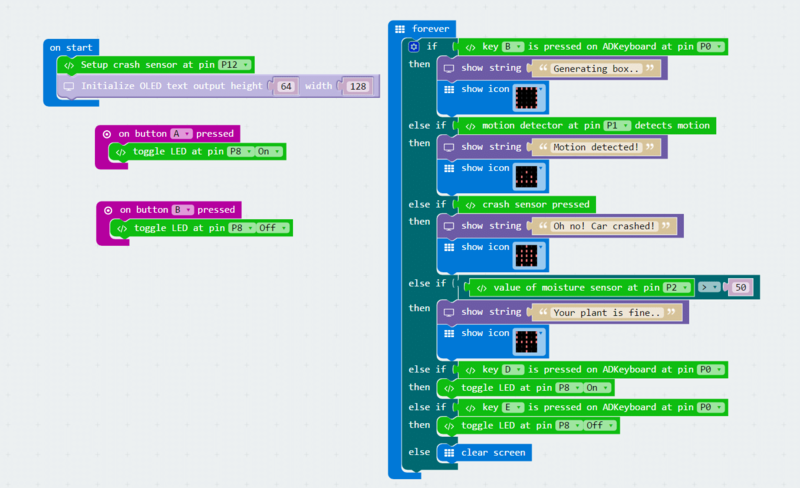 A more technical guide is available on the micro:bit edge connector documentation page.